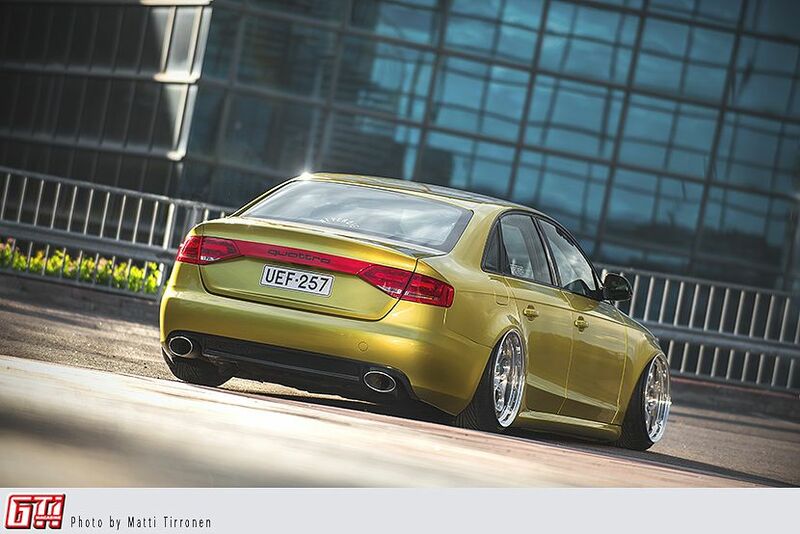 This Audi A4 is no stranger to us, since it has been introduced in our magazine before. Back then it looked notably different with black paint and a narrower body, among many other things. But that's no surprise for those who know the owner, Mika Hermaala, since he tends to create a new look for every summer. According to him this is the last evolution of this B8 Audi, so let's have a decent look at this magnificent jewel of a car. One more time. Mika bought this Audi in 2012, when he wasn't even allowed to drive a car yet. Even then he knew that the car had seen enough road in stock form, and should be enhanced into something better. After that Mika has evolved this A4 into better forms, time after time. Wheel's have been changed more often than most people change in their lifetime, the car has been wrapped at some point, and the list goes on. When you think that the car originally had the bare minimum of accessories, it's hard to believe that this leather clad vessel of gods is the same car at all. As is usual, the stock car was too high and caused acrophobia. This was first cured with Eibach Pro-Street coilovers, but the local fuzz was not happy with that solution (the car was too low, they say, and took the license plates away). Air suspension was the key here, and with the help of a good friend, Mika ordered the necessary parts and installed them. 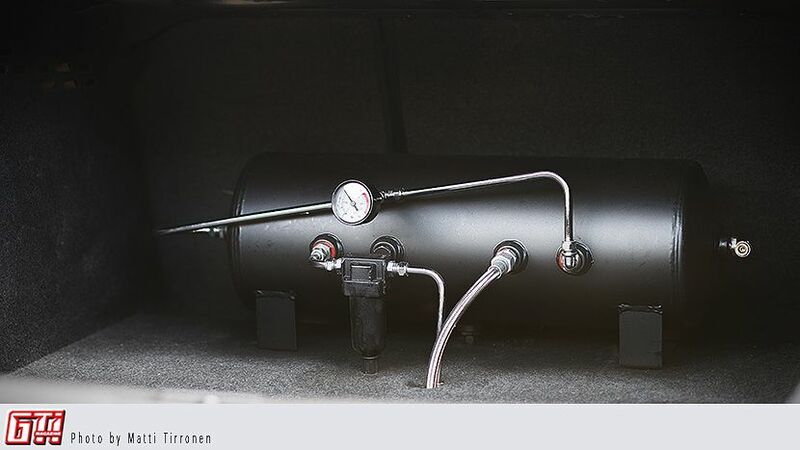 The suspension used is HP Drivetech with an Accuair E-Level controller, a Viair compressor and a five gallon tank. This configuration has been deemed worthy of this car, and has proved to be a setup that works well in daily use. The body is several centimeters wider than stock, and it took only three weeks of well spent time and lots of headache to achieve this. The obnoxiously huge wheels seen in the picture do not fit well in stock arches, so they were totally redesigned as well. The RS4 sideskirts were a challenge in themselves, and they had to be split into six parts, and then shorten, trim and use magic words and hexes to make them fit. The bodywork is done on a level that rivals the highest pro level, so the end result looks like a factory one-off special. The Austin Yellow paint is the same used in BMW's M4, and while it was a risky move, it paid off. The interior matches the exterior in its glory. Diamond stitchings and BMW's Dakota leather upgrade the stock interior to a whole new level. The same paint used in the exterior can be found in the interior, and yellow seatbelts work as a cherry on top. The steering wheel is from an Audi MK3 TT, and the pedals are from a RS4. You can see the Accuair air suspension controller in its dedicated space in the cupholder. Mika ordered these RAD48 LR 2.0 wheels from his friend, Mario. The wheels were 80% redesigned for his purpose, however, in order to extrude as much lip as possible. The final specs in every corner are 19x11.5” and ET0. Since the wheels had snowball's chance to fit in the stock arches, the arches were redesigned from scratch. While the car was being painted, Mika decided to upgrade the brakes with RS4 calipers and discs. 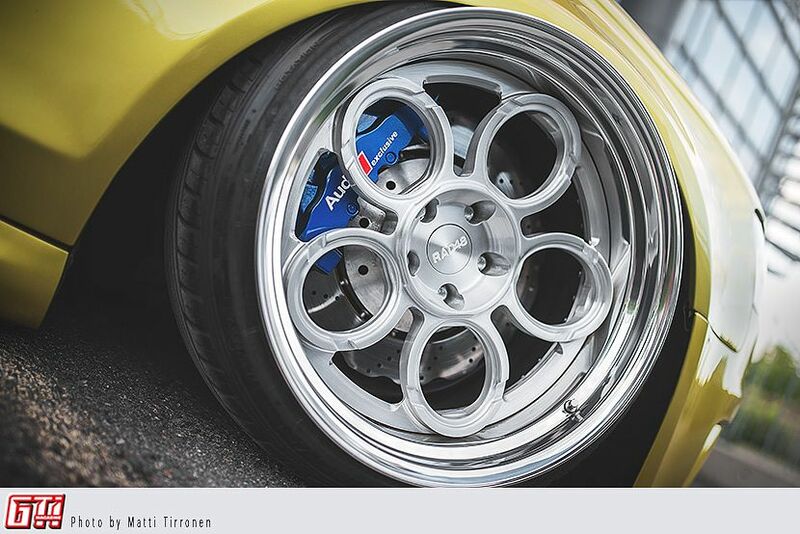 While he was at it, he also painted the calipers blue. Every detail has been carefully planned, and the attention to detail shows. For example, this carbon fiber S4 rear diffuser took mere four hours of installation. 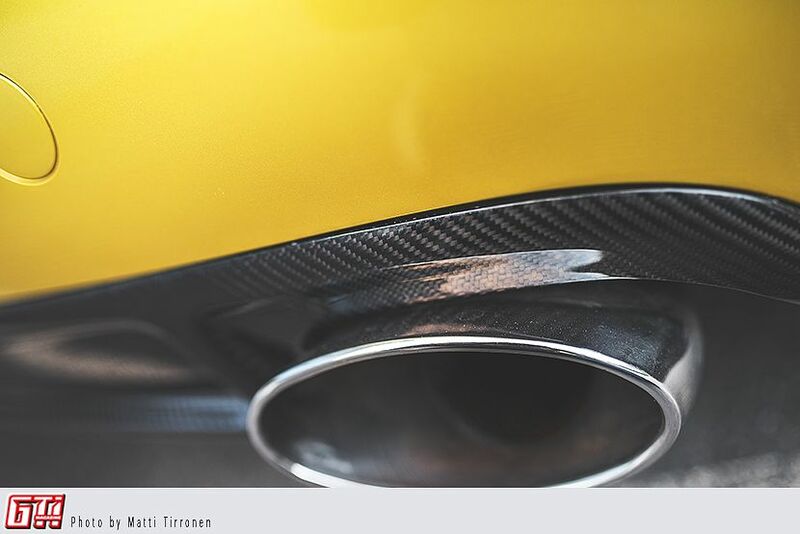 The exhaust tips are naturally from a RS6, since this car seems to be a melting oven of different Audis. When the car was finished, Mika visited the legenady ”Wörthersee Tour” with it. Some problems with the air suspension occured on the day he left Finland, so he had to visit Hp Drivetech's headquarters in Austria to get it fixed. 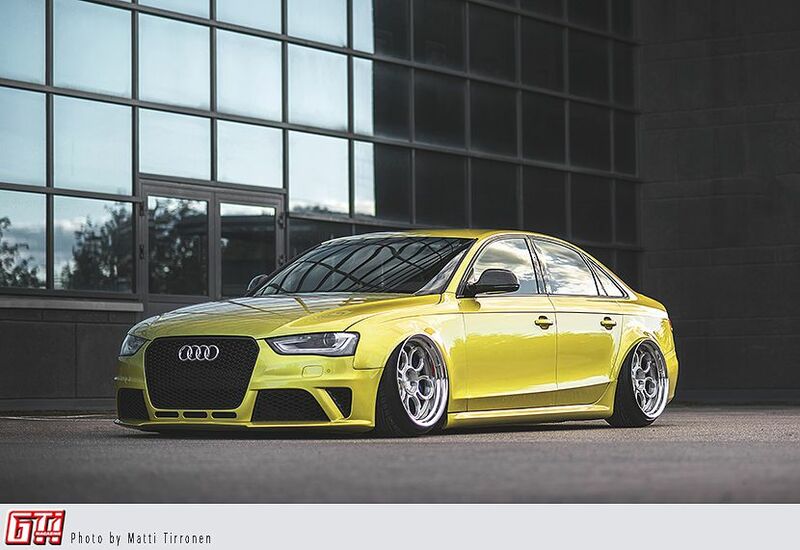 The owner of said company commented the car by saying ”you have the best Audi in Wörthersee 2016”. Not a bad merit. Now, in the late summer of 2016, the car is finished and on sale. What happens next, we do not know but are eager to see. The unknown future rolls toward us. Teemu Neulanen (Mr. Widebody), Pasi Markkanen, Jerry Myllymäki, Markus Karlstedt, Lasse Aunala, Joonas Malinen, Mylpsä, Ipe, Topias Iivanainen (TopWrapz), Mario Mattick, Rick Findeisen, and everyone else who has been helping during these years!